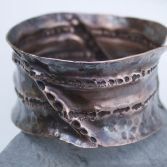 This lovely Organic Fold Formed Cuff is made of Copper that has been hammered and folded several times to create the beautiful organic patterns. Each time a fold is made the metal hardens and it has to be annealed (heated until it glows red) which makes the Copper soft again so it can be folded and hammered a good few times. 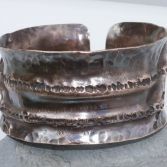 Each Copper Cuff is a one of a kind item due to its handcrafted nature. 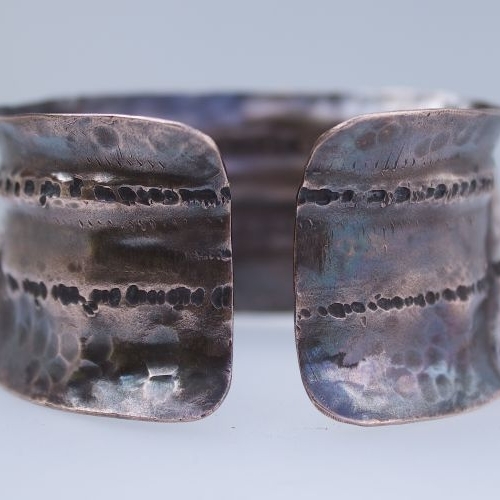 I make this Cuff to order as a very similar ones can be made, although no two would be the same. However the images shown are a good representation of the Cuff you would receive. The Cuffs is approximately 4.5cm wide and the size of the Cuff is is a medium to large. Other sizes can be ordered please email me to discuss. Please allow 4-5 days from date of ordering. 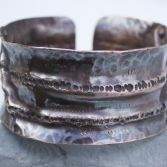 The cuff also has an anti-clastic curve so it's very comfortable to wear and get on and off the wrist The Cuff is highly polished, i then add patina to give the copper its rich colours which will change with time. To keep it looking great polish your Cuff with a silver polishing cloth to bring back the highly polished look.